CPDI Africa works through annual design competitions, where students and practitioners in the global design community develop residential prototypes, guided by a ‘kit of parts’ database of African architectural elements. A panel of distinguished Jurors, consisting of our well renowned architects, Africanists, artists, urban planners and engineers, will select wining designs for the CPDI Annual design-build events in Africa, and for the publication of our annual design compendium. Designers who create winning prototypes that best fit interpretations of modern African architecture, will receive cash prizes, design recognition and also participate in the design-build trips to the various featured African countries. CPDI Africa works through annual design competitions, where students and practitioners in the global design community develop residential prototypes, guided by a ‘kit of parts’ database of African architectural elements. A panel of distinguished Jurors, consisting of well renowned architects, Africanists, artists, urban planners and engineers, will select wining designs for the CPDI Annual design-build events in Africa, and for the publication of our annual design compendium. 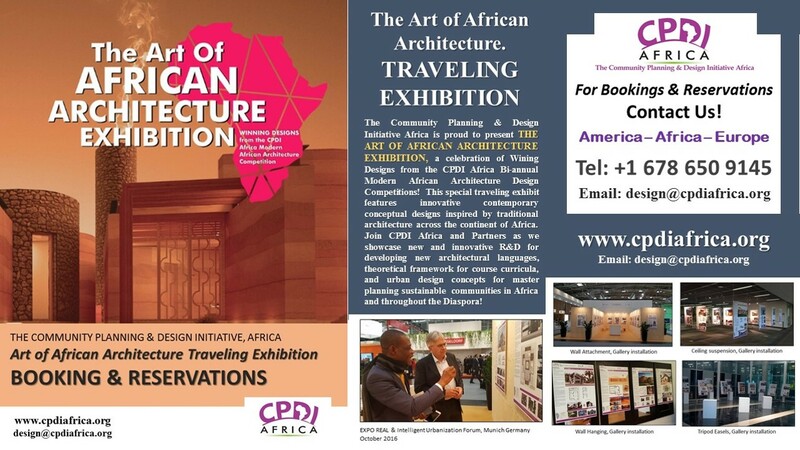 Designers who create winning prototypes that best fit interpretations of modern African architecture, will receive cash prizes, design recognition and also participate in the design-build trips to the various featured African countries. The CPDI design-build competition is open to both students and practicing designers across the world; applicants may register from all parts of Africa, the Americas, Caribbean, Europe and Asia. Participants may enter the competition as individuals, or may submit their entries as part of a team of designers, artists, engineers, and planners. The competition is open to any race, religion or creed, and encourages collaborative ventures between development professionals in Africa and the Diaspora.